Legos Are Getting Angrier And That's Not Funny, Study Says : The Two-Way A researcher in New Zealand has examined the tiny toys' expressions. Most of them still look happy, but an increasing number look rather upset. He thinks that might not be good for children. The company says parents can always just switch the toys' heads. 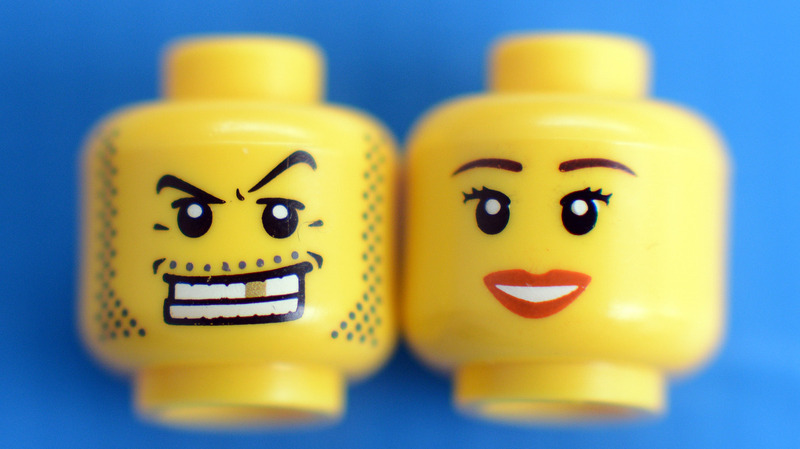 Lego faces are more often looking like that guy on the left, researchers say. "The number of happy faces on Lego toy mini-figures is decreasing and the number of angry faces is increasing, a University of Canterbury robot expert says." That's correct. A robot expert at New Zealand's University of Caterbury who's also a big fan of Lego figures has studied them and determined that in recent years the Danish company has been adding more angry faces to its mix. And Christoph Bartneck, acting director of the university's Human Interface Technology Laboratory, says in a statement released by the school that his findings are significant because "children's toys and how they are perceived can have a significant impact on children. ... We cannot help but wonder how the move from only positive faces to an increasing number of negative faces impacts on how children play." -- "We asked participants to give one rating on one of the six scales that were labeled: anger, disgust, fear, happiness, sadness, and surprise." -- 324 faces were rated as showing "happiness." -- 28 seemed to show "disgust." -- 23 were classified under "surprise." -- 11 registered as "fear." Though just more than half fell into the happy category, Bartneck writes that "we can observe a trend over time that the proportion of happy faces decrease and the proportion of angry faces increase." Bartneck knows his way around Lego figures. He's one of the driving forces behind the "LEGO Minifigure Catalogs," a group of "fans dedicated to the beauty of Minifigures." He tells The New Zealand Herald that "while Lego figures in the 1970s all had the same smiley face, from 1989 the range expanded to include hundreds of different emotions." It's "a sign of the times," he adds. "If you go into a toy store these days what you see is that a lot of the themes and topics, particularly for the toys for the boys, are very rich in conflict and war and weapons." "Roar Rude Trangbaek, communications manager for Lego, said every toy developed by the manufacturer was tested by a range of expert children, while child psychiatrists, parents and teachers were also consulted. Research conducted for the company found that children, especially boys, enjoyed playing out conflicts between characters, he said. 'The conflict between good and evil is nothing new,' said Trangbæk. 'But the characters always have classic Lego humor – the good guys always win in the end.' "
If an expression concerns them, "they can always just switch heads with another figure," he said.